As I said in this post, a party always pushes me to finish lots of projects. Before G’s first birthday party, I finally redid my mismatched patio set, and I also tackled a few projects for the front porch and back entryway. Our back door has been driving me crazy for a while now. Since our driveway is in the back of our house, pretty much everyone uses the back door to come in and out. 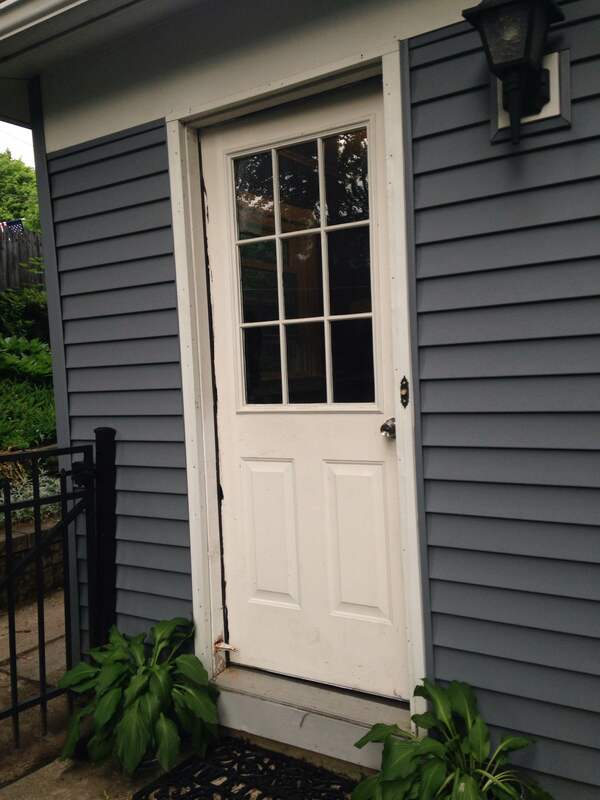 The old metal door was chipped and the light gray paint color showed every paw mark and doggy nose smudge it met. When we moved in, there was also a ridiculously heavy, thick storm door on the outside that was not only inconvenient but very ugly. I ripped that off last year, and in addition to a slightly less ugly metal door, we were left with a metal door frame pockmarked with screw holes, with chipping white paint on the wooden parts. So, I decided something needed to be done before the party. While I still need to address the frame, the door has now been updated to a glossy black that I love (I used Rustoleum High Gloss Black paint in a can — my first experience with brush-on oil paint and I’m hooked for the high shine and super hard finish!). 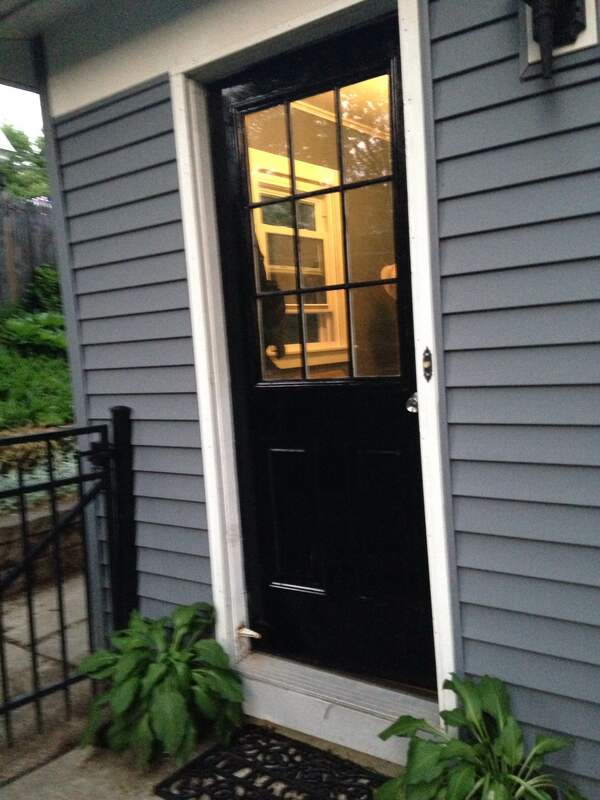 The door really pops off the siding and matches the fencing and outdoor sconce. It’s a huge improvement! For the front porch, S hung four ferns with black chain about a month ago. 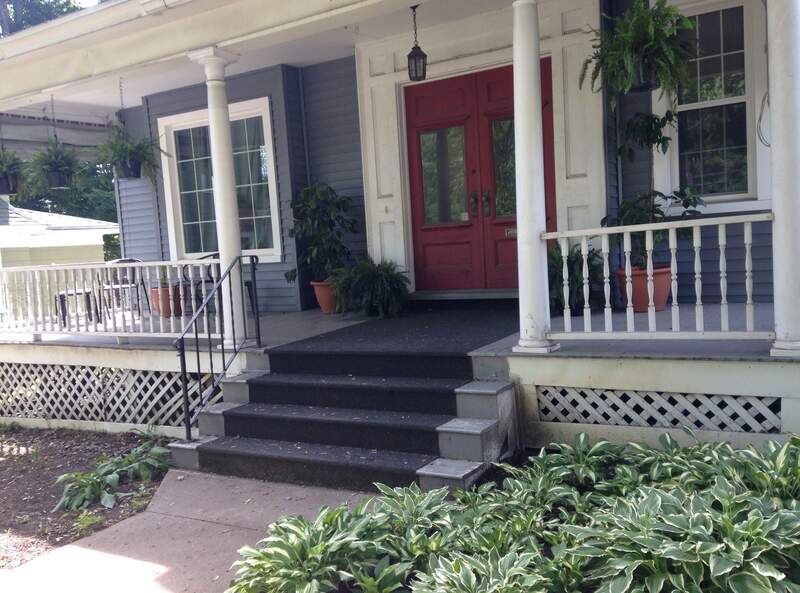 They still need to fill out a bit (I split two big ones up into four so that I could reuse the original hanging planters – which they had outgrown), but they make me happy everyday and vastly improve the look of the porch (which also needs to be painted!). 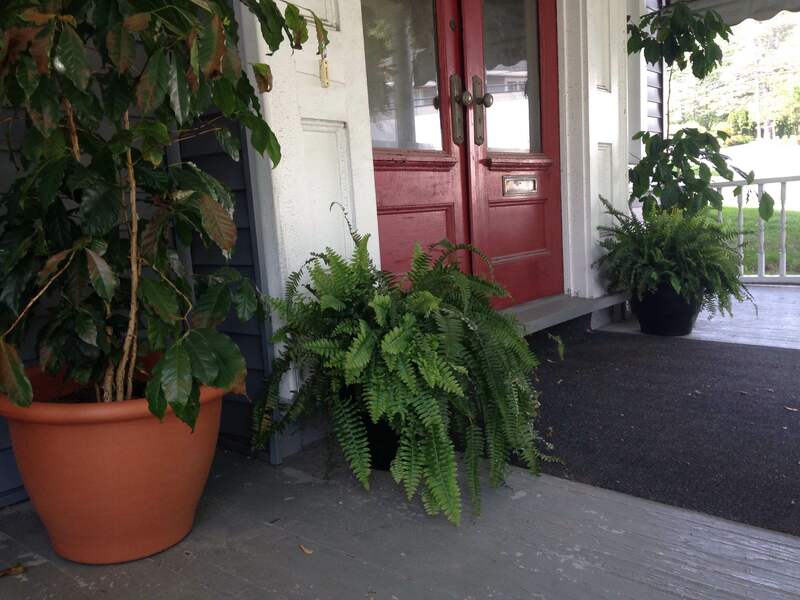 I spray painted two faux terracotta planters black to sit in front of our doors, and put Boston ferns in those, too. 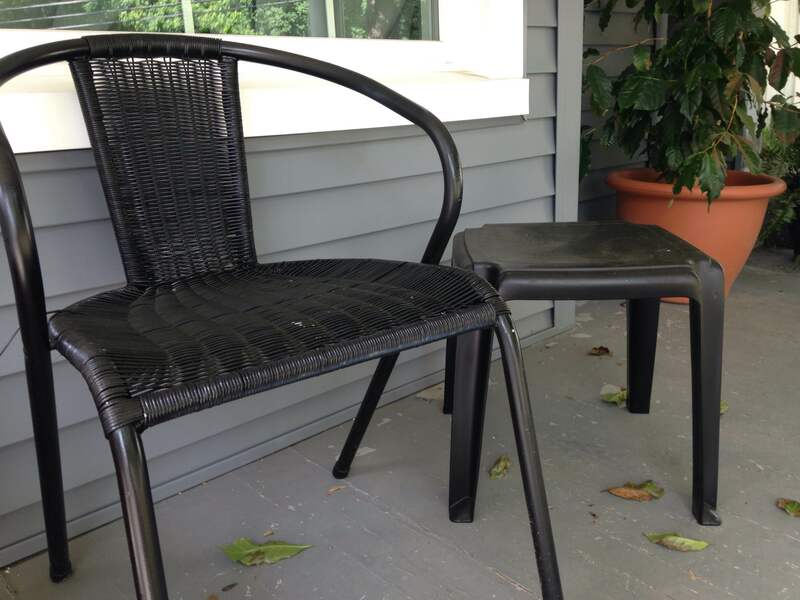 Then, I continued on my spray paint run and painted two faux wicker outdoor chairs and two hunter green outdoor tables black as well. Since warm weather finally seems like it’s here to stay in upstate NY (crossing my fingers we don’t get another cold stretch! ), we moved S’s three coffee plants out to the porch, too. They are such big and beautiful plants, I love what they add to the look! While I planned on painting those planters black as well, I think I will hold off for a while. 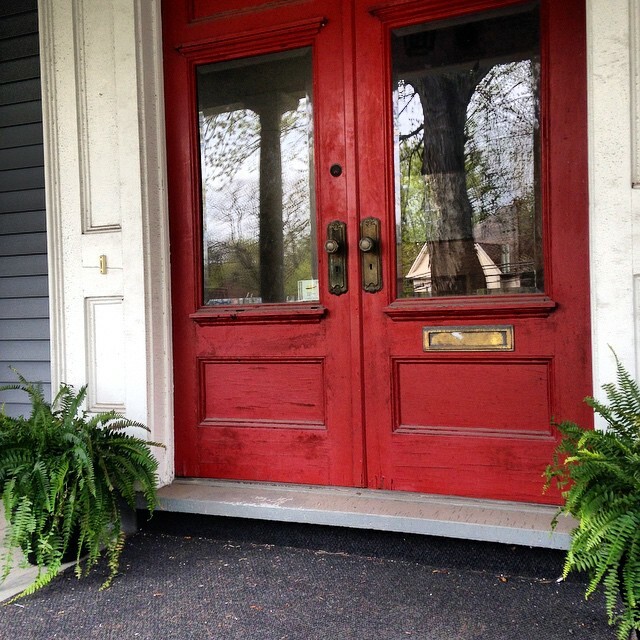 I like the pop of terracotta against the black and blue-gray, and until I paint the front door, it ties into the red. 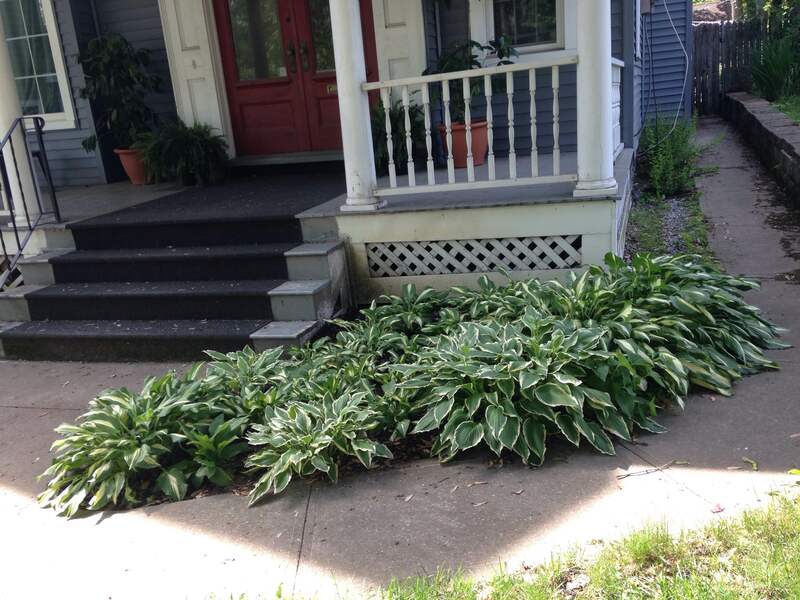 My last project was to move a bunch of stray hosta plants that were overgrown and misplaced all over our property to the left side of the front porch. When we moved in, there were huge overgrown evergreen bushes that were mostly dead and peaked well above the porch roof. After taking those out, the front looks bare. We still need to redefine the flower beds and lay grass seed on the right side before I can put any plants in there, but for now, at least the left side looks purposeful!